Used to make inexpensive gems, chemicals, fire bricks, magnesium metal and more. Crushed Magnesite: Heated to produce magnesium oxide that is used as a raw material for the chemical industry, a refractory material for the steel industry, and as a minor source of magnesium metal. Magnesite is a magnesium carbonate mineral with a chemical composition of MgCO3. It is named after the presence of magnesium in its composition. Magnesite usually forms during the alteration of magnesium-rich rocks or carbonate rocks by metamorphism or chemical weathering. Magnesite is used to produce magnesium oxide (MgO), which serves as a refractory material for the steel industry and as a raw material for the chemical industry. Small amounts of magnesite are also used as a gem and lapidary material. Magnesite from Chewelah, Washington. Specimen is approximately 3-1/2 inches (8.9 centimeters) across. Magnesite can form by several processes. Some of the more common are described below. 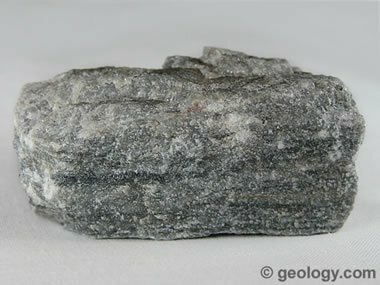 The carbonation of magnesium-rich rocks such as peridotite or serpentinite during regional, contact, or hydrothermal metamorphism. Magnesite formed this way is sometimes cryptocrystalline, with a significant chert content. The alteration of limestone, marble, or other carbonate-rich rocks by magnesium-rich solutions during regional, contact, or hydrothermal metamorphism. High-purity magnesite can be formed by this process. Formation in the regolith above weathering ultramafic rocks and other rocks with a high magnesium content. This formation is facilitated by carbonic acid in subsurface waters and often produces nodular magnesite. Precipitation as a secondary mineral in veins and fractures that cut across carbonate and ultramafic rocks. Diaphaneity Cryptocrystalline material is usually opaque; otherwise translucent to transparent. Often impure. Cleavage Perfect, but often not seen in cryptocrystalline specimens. Diagnostic Properties Can be hard to identify and is often confused with howlite. Effervesces in room-temperature dilute HCl (5%) when powdered. Perfect cleavage if visible. Specific gravity higher than howlite. Refractive index of 1.509 to 1.700 with strong birefringence blink. Uses Heated to produce MgO which is used to produce refractory bricks, refractory cements, magnesium metal. High-quality pieces of magnesite are used to cut beads, cabochons, tumbled stones, and other lapidary projects. Magnesite can be difficult to identify in hand specimens because it often departs from its anticipated properties. It is often cryptocrystalline, which can obscure its cleavage. Magnesite is often silicified or in an admixture with chert, which makes it deceptively hard. The presence of significant chert will also reduce the apparent effervescence with HCl. 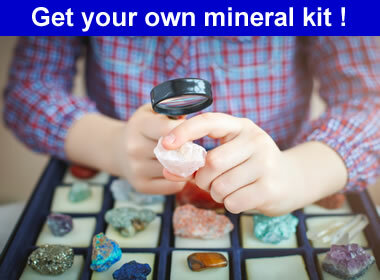 If you want to identify magnesite, the steps below will probably be helpful. Some assume that you have a specimen that can be used for destructive testing. Check for an acid reaction: Produce some powder by scraping the specimen across a streak plate. Then place a drop of dilute (5%) hydrochloric acid on the specimen and look for an effervescent reaction. You might need a hand lens to see tiny bubbles growing very slowly from the powder. Test the specific gravity: Magnesite usually has a specific gravity of between 3.00 and 3.20. It might be as low as 2.8 if it has a significant quartz or chert content. This low specific gravity will be paired with a higher than normal hardness if your specimen contains significant chert or is silicified. Test with a refractometer: If your specimen has a polished surface and you have a refractometer (and are good at using it), you will be able to do one of the most reliable tests for magnesite. Magnesite has an index of refraction that ranges from about 1.509 to 1.700, and a birefringence of 0.191. But the most important property is that it exhibits birefringence blink across the 1.509 to 1.700 range. 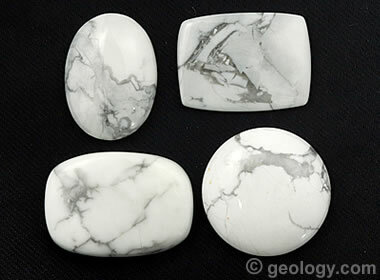 Magnesite Cabochons: Magnesite is often cut into cabochons. The cabochons are usually white and have a gray, black or brownish "matrix". The matrix and their soft polished luster might remind a person of turquoise, and these cabochons are often called "white turquoise"; however, that name is a misnomer. 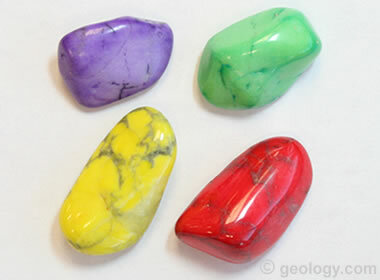 Magnesite cabochons are often dyed a variety of colors, especially a blue that gives them an appearance similar to turquoise. Magnesite has a chemical composition of MgCO3, and when it is heated it will dissociate into MgO and CO2. MgO has an extremely high melting temperature, and that makes it a good refractory material in many steelmaking, metallurgical, and ceramic processes. MgO is one of the most commonly used materials for making the bricks used to line kilns, industrial ovens, and blast furnaces. MgO is also used to make fertilizers, magnesium chemicals, and refined into magnesium metal. 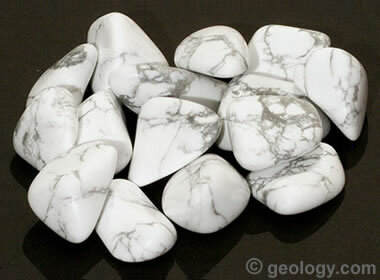 Tumbled Magnesite: Magnesite is frequently used to make tumbled stones, cabochons, beads, and small lapidary projects. 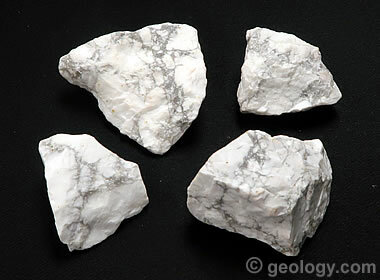 Magnesite is commonly used to make tumbled stones, beads, and cabochons. White magnesite is porous. It has the ability to be cut and reliably absorb dye to produce almost any color. Magnesite dyed a turquoise color has been a disclosed and undisclosed substitute for turquoise for nearly 100 years. A lot of people have been fooled by magnesite dyed to look like turquoise, and some have been fooled into buying magnesite dyed to look like lapis lazuli. Be cautious when you are buying cabochons or tumbled stones with spectacular colors. Ask if they have been dyed. Dyed Magnesite: Magnesite is porous and easily accepts dye. Since it is white, it can be dyed vibrant colors with reliable results. A destructive test that is fairly reliable is to dip a cotton swab into fingernail polish remover and scrub the material with it. Many dyes used on magnesite can be scrubbed off with fingernail polish remover. Also, scratching the material with a hardness pick or nail can remove the dyed surface to expose the bright white magnesite below. Low manufacturing costs and the wide spectrum of dyed colors make magnesite an excellent material for making colorful, low-cost costume jewelry and craft projects. The downside of using magnesite for making jewelry is its lack of durability compared to other gem materials. The low cost is a trade-off for customers accepting a material with a Mohs hardness of 3.5 to 5. If you buy magnesite for jewelry use, keep its durability in mind.